May 20, 21, 22, 23 & 24, 1980. GP wrote: “Dr. Johnson had a high regard for Oliver Goldsmith and he and his friends formed a ‘cheer group’ to see this play through its first performance at Covent Garden in 1773. The need not have worried; the play was an immediate success and has been so ever since. It is good humoured, without the malice of the Restoration Comedies of the day. The characters are likeable and the fun, boisterous as Tony Lumpkin ‘leads’ his doting mother a fine dance. The young ladies are delightful; the comic plot beautifully constructed; the play reflects the manners and social attitudes of its day but has a heart and warmth! Fears that Wick Theatre Company’s latest production would pose something of a language barrier proved totally unfounded at the Barn Theatre last week. The flowery speech which makes She Stoops to Conquer by Oliver Goldsmith such a joy to the ear might, one supposed, have been largely lost on a modern audience. But that was to underestimate the intelligence of those present on the opening night and the clarity and precision of Wick’s version under the direction of George Porter. The play’s humour and charm, which first delighted playgoers more than 200 years ago, bubbled afresh like a virgin spring, laying bare the foibles and fopperies of 18th century England. The legendary Dr. Johnson, a noted ‘fan’ of Goldsmith, would surely have approved of the craftsmanship and technique that went into Wick’s production – whether it was the fine costumes of Pat Moss or a strong all-round display of pinpoint acting. Nobody came across better than David Creedon who played the puckish go-between Tony Lumpkin, around whom most of the action and comedy revolved. And interest never flagged in the principal pair of lovers – Kate Hardcastle who ‘stoops’ to the rank of barmaid to conquer Marlow the tongue-tied nobleman’s son – thanks to brilliantly executed performances by Jeanette Goode and Tim Cara. The plot was kept simmering by equally praiseworthy contributions from Frances Moulton [Mrs. Hardcastle], Keith Denyer [Mr. Hardcastle], Peter Joyce [Hastings] and Valerie Burt [Constance Neville], while that most amusing of actors, Alan Upton, made an all too fleeting appearance as Sir Charles Marlow. Wick debutantes Joan Bearman [Maid] and Ronald Cheesman [Landlord] slipped easily into two of the more minor rôles, alongside Bill Mack, John King and Dennis Picott who all had to portray oaf-like characters. 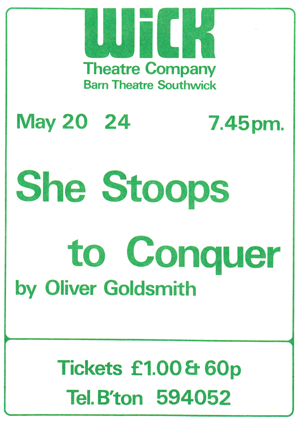 The Wick Theatre Company production of She Stoops to Conquer maintained elegance and style throughout and I congratulate director George Porter. Notably there was David Creedon’s intelligent playing of Tony Lumpkin, surely much nearer what Goldsmith intended. Kate Hardcastle was played by Jeanette Goode with charm and gracefulness and Peter Joyce was an equally elegant Hastings. Tim Cara, as the other swain, carried it off well.